My friend Sam drew my attention to this article about the dynamic of female relationships on social media, and how to address comments that are, in a way, solicited. It speaks about “honesty” platforms like Formspring, wherein the user can ask other users/”friends” what others think of them. Presumably this is done with the hopes of getting glowing reviews or encouragement. However, the platform is being used increasingly as a means to anonymously hurt each other. This article is actually an update to the book “Odd Girl Out,” a well publicized chronicle of the covert but comprehensive bullying techniques of teenage girls. For the better part of my childhood, my best friends were boys. I interacted with girls in dance classes and on sports teams, but for the most part, would choose to hang out with the guys. I wore shorts or pants all the time, the result of having my skirt lifted unwillingly in kindergarten (these memories stick, people!). I was what you would consider a “tomboy,” and wouldn’t have had it any other way. Still wouldn’t! Sometime around high school, I managed to find a group of girls that I could socialize with and didn’t feel forced to be catty, hurtful, or judgmental all the time. One of the things I valued most about my male friends was their ability to be open. When one was mad at the other, they would talk, they would yell, sometimes they would fight…but they would address it. I always saw girls defer to rumor-spreading or mudslinging over talking things out, and always hated that. Guys had it right, I thoughts. But in meeting this circle of friends in high school, several who I still am close with today, I realized that I didn’t dislike girls- I just hadn’t met the right ones yet. As I continue to mature, I’m still more comfortable with men. Some of my best friends in the world to this day are men. But I’ve also come to a point where I can count several women among my best friends too. I’ve shed my propensity to hide behind shorts and pants, in favor of heels, skirts, and SO many dresses sometimes it makes my head spin to see how far I’ve come. But I see the hurtful things that girls say to each other, on platforms such as Formspring, and I yearn to determine where such mindsets come from. Where is this socialization coming from? So much is said about the deplorable and hurtful ways that men treat women, and rightfully so. That said, we should be equally outraged about how women treat other women. In both cases, the root causes of such socialization need to be addressed, and aggressively combated. I suppose my dream would look something like this. 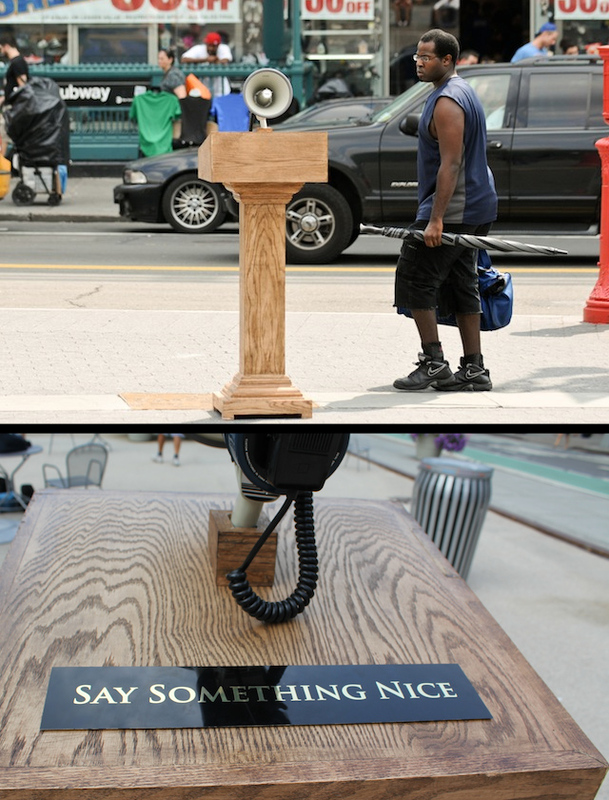 Improv Everywhere recently placed a megaphone podium in Times Square with the directive “Say Something Nice”. Very few people took the opportunity to advertise, self-promote, or demean. But some did. And in the best case scenario, the directive wouldn’t be needed. People would walk up, clear their throats, and uplift each other.